ISRAËL – Herodium - While attention is focused on a blockbuster exhibition purporting to display the tomb of Herod the Great, two archaeologists claim there's no way the egomaniac king was interred there. In May 2007, at a dramatic press conference, archaeologist Ehud Netzer revealed that King Herod’s tomb had been discovered on the slopes of Herodium. 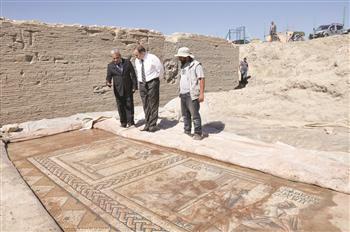 Now two archaeologists argue that what was found there can't be Herod's last resting place. CHINE – Beidazhao Qiandong - Archaeologists have unearthed about 300 pieces of cultural relics from a cluster of ancient tombs in north China's Hebei Province. The tombs, located in Beidazhao Qiandong village of Nanhe County, 150 km south of the provincial capital of Shijiazhuang, are believed to be from the middle and late West Han Dynasty (206 BC- 24 AD) and middle Tang Dynasty (618-907), archaeologist Li Lianshen was quoted as saying by state-run Xinhua news agency. Archaeologists have discovered 73 tombs altogether since the excavation started in May and more than 4,000 square meters of land have been combed through, Li said. The relics are mostly pottery, chinaware and bronze ware that were used in daily life, Zhang Xiaozheng, head of the excavation, said. Judging from their shape and structure, the tombs are likely to belong to ordinary families, he said. About 10 more tombs are yet to be excavated, he added.